Home / Assignment #347: Birds In Flight / Military precision! Used my Canon 5D Mark IV, 400mm lens, handheld because tripod shots don't work as well for fast-moving, altitude-climbing geese. I find that these geese often fly in formation, in small and larger groupings. Better aerodynamically, no doubt! 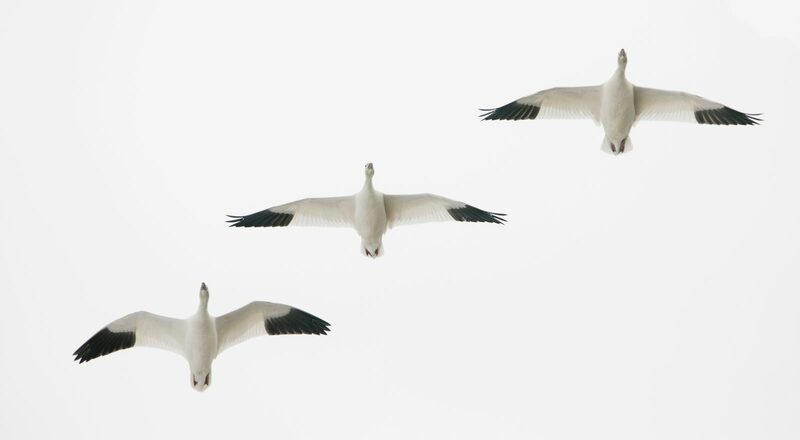 Migrating Snow Geese flying in tight formation. Often when a flock takes off there are hundreds of geese airborne at once. Found these three amidst others.